Bask in the glory of the Insignia Noire90, another magnificently crafted enclosure part of Insignia’s 2nd generation Leak Free showers. Designed to reflect the taste and style of its discerning owner who requests something extra. The Noire90 is an eye-catching masterpiece, to enhance any modern bathroom design. 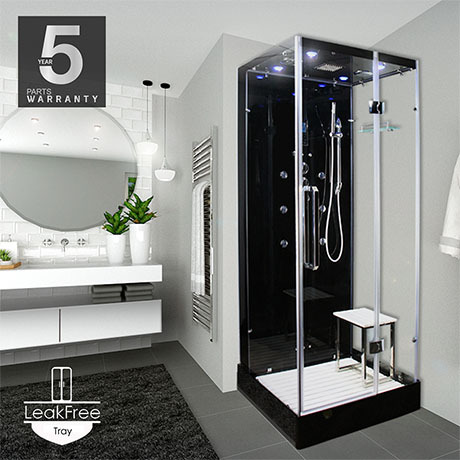 From the midnight black base and body, illuminated by the glistening sparkle of the chromatic features, this steam shower welcomes new members into the class of prestige. Want to join? Choose your showering option; the luxurious stainless steel 64 nozzle ‘Hi-Flo’ monsoon shower head to engulf you in complete water immersion; the tastefully chromed metal bodied slin-line designer hand shower is perfect for a quick shower where time is of the essence and the soothing body jets are ideal for simply sitting to unwind after a hard day. Relax in style on the ergonomically designed handmade white slatted stool, complemented beautifully by the matching floor, contrasting off the midnight black base and body of the shower giving the aesthetics an alluring cohesion. The Noire90 delivers a bold and striking look, which is only complemented further by the features within. Opt for a relaxing steam, intensified by the wonderful fragrance from Insignia’s aromatherapy creating a tranquil sensory experience within your own bathroom. With an enthralling interplay of coloured lighting you can enjoy your very own piece of heaven, all to the sound of your own music through the Bluetooth control and Insignia’s twin speaker system rounded off perfectly with infused steam with Insignia's own aromatherapy system. The 8mm thick tempered glass surround is ‘Insignia Smart Glass’ with self-cleaning technology and water repellent properties. The Noire exudes the high-end quality for those that want something more special, bringing that je ne sais quoi to your home and bathroom.